Bu çalışma günlük konuşmalarda ortaya çıkan anlık ve söyleşimsel kimlik inşa süreçlerine ve bu süreçlerin evlilik programlarındaki görünümlerine dayanmaktadır. Evlilik programları, katılımcılara eş adayları ile yüz yüze etkileşimde bulunarak benliklerini ortaya koyma ve benliklerini karşılıklı ve anlık olarak yapılandırma konusunda bir ortam sunmaktadırlar. Bu bağlamda çalışmamız, evlilik programlarındaki katılımcıların karşılıklı konuşmaları sırasında konuşma bağlamına ve karşısındaki adaya göre benliklerini nasıl inşa ettiklerini göstermeyi amaçlamaktadır. Çalışmaya kaynaklık eden veriler Türkiye televizyonlarında gündüz kuşağında yayınlanan “Esra Erol’la” adlı programın 29 Ağustos 2016 ve 23 Haziran 2017 (2. sezon) tarihleri arasında yayınlanmış olan 213 bölümünden oluşmaktadır. Çalışmada sunulan örnekler bu 213 bölümün incelenmesi çerçevesinde araçsal örneklem ile belirlenmiş iki konuşma kesitini kapsamaktadır. Çalışmanın amacı ekseninde, katılımcıların benlik pazarlıklarına dair eylemleri işaretleyen bu konuşma kesitleri Du Bois (2007) tarafından ortaya konulan Duruş-alma ve Davies ve Harré (1990; 2003) tarafından temelleri atılan Konumlandırma Kuramı (İng. Positioning Theory) üzerinden incelenmiştir. Böylelikle katılımcıların ‘benlik pazarlıklarına’ dair dilsel eylemler bu kuramların ortaya koyduğu üç boyutlu kavram modelleri üzerinden tartışılmış ve anlık ve söyleşimsel kimlik inşasına bir bakış getiren bu iki kavramsal çerçevenin kesişim noktalarına dair örneklendirmeler üzerinden kuramsal bir anlayış sunulmaya çalışılmıştır. The present study depends on the instant and dialogic identity construction processes in everyday talk and their realisations in marriage programs. These programs offer the participants and their spouse candidates a context in which they can create their selves and construct these selves instantly and mutually in face-to-face interaction. In this frame, our study aims to demonstrate how the participants in marriage programs construct their selves in accordance with the context and the candidate in their mutual interactions. The data leads to the study comprises of the conversation segments taken from the 213 episodes of a program, “Esra Erol’la” which had been broadcasted in day time between the dates of 29 August 2016 and 23 June 2017 (Season 2). The extracts presented in the study include two conversational segments which are identified through the analysis of the 213 episodes and purposive sampling. In the axis of the aim of study, these conversation segments which show the acts of self negotiations of the participants have been explored in terms of stance-taking proposed by Du Bois (2007) and Positioning Theory introduced by Davies and Harré (1990; 2003). Thus, the linguistic acts for ‘self negotiations’ of the participants have been discussed through the three dimensional models that these theories had proposed and a theoretical insight over the instances of intersections of these two theoretical frameworks which bring an understanding for the instant and dialogic construction of identity have been suggested. Antaki, C. ve Widdicombe, S. (1998). Identity as an achievement and as a tool. C. Antaki ve S. Widdicombe (Yay. haz. ), Identities in Talk içinde (s. 1-14). Londra: Sage. Archakis, A. (2012). Doing indiscipline in narrative performances. How Greek students present themselves disobeying their teachers. Narrative Inquiry, 22(2), 287-306. Archakis, A. ve Tzanne, A. (2005). Narrative positioning and the construction of situated identities. Evidence from conversations of a group of young people in Greece. Narrative Inquiry, 15(2), 267-291. Archakis, A. ve Tzanne, A. (2009). Constructing social identities through story-telling: Tracing Greekness in Greek narratives. Pragmatics, 19(3), 341-160. Burr, V. (1995). An introduction to social constructionism. Florence, KY, US: Taylor & Frances/Routledge. Bakhtin, M.  (1981). The dialogic imagination: Four Essays by MM. Bakhtin. Austin, TX: University of Texas Press. Bamberg, M. (1997). Positioning between structure and performance. Journal of Narrative and Life History, 7, 335-342. Biber, D. ve Finnegan, E. (1989). Styles of stance in English: Lexical and grammatical marking of evidentiality and affect. Text, 9, 93-124. Biber, D., Johansson, S., Leech, G, Conrad, S. ve Finegan, E. (1999). The Longman grammar of spoken and written English. Londra: Longman. Bruner, J. S. (1991). The narrative construction of reality. Critical Inquiry, 18(1), 1-21. Conrad, S. ve Biber, D. (2000). Adverbial marking of stance in speech and writing. S. Hunston ve G. Thompson (Yay. haz. ), Evaluation in text: Authorial stance and the construction of discourse içinde (s. 56-73). Oxford: Oxford University Press. Davies, B. ve Harré, R. (1990). Positioning: The discursive production of selves. Journal for the Theory of Social Behaviour, 20, 44-63. Davies, B. ve Harré, R. (1999). Positioning and personhood. R. Harré ve L. van Lagenhove (Yay. haz. ), Positioning theory içinde (s. 32-52). Malden, MA: Blackwell. Davies, B. ve Harré, R. (2001). Positioning: The discursive production of selves. M. Wetherell, S. Taylor ve S. Yates (Yay. haz. ), Discourse theory and practices içinde (s. 261-271). Londra: Sage. Davies, B. ve Harré, R. (2003). Positioning and personhood. Harré, R. ve van Langenhove, L. (Yay. haz. ), Positioning theory içinde (s. 32-52). Oxford: Blackwell. De Fina, A., Schiffrin, D. ve Bamberg, M. (2006). Discourse and identity. Cambridge: Cambridge University Press. De Fina, A. (2003). Identity in narrative. A study of immigrant discourse. Amsterdam and Philadelphia: John Benjamins Publishing Company. Du Bois, J. W. (2007). The Stance triangle. Englebretson, R. (Yay. haz.) , Stance – taking in discourse: Subjectivity, evaluation, interaction içinde (ss. 139-182). Amsterdam: Benjamins. Du Bois, J. W. (2014). Towards a dialogic syntax. Cognitive Linguistics, 25(3), 359-410. Ferveit, A. (1999). Reality TV in the digital era: a paradox in visual culture? Media, Culture and Society, 21, 787-804. Fiske, J. (2003). İletişim çalışmalarına giriş. Ankara: Bilim ve Sanat Yayınları. Georgakopoulou, Α. (1997). Narrative performances. A study of Modern Greek storytelling. Amsterdam and Philadelphia: John Benjamins Publishing Company. Georgakopoulou, Α. (1999). Doing youth in and through conversational narratives. J. Verschueren (Yay. haz. ), Language and ideology. Selected papers from the 6th International Pragmatics Conference, V.1 içinde (s. 125-142). Antwerp: International Pragmatics Association. Georgakopoulou, A. (2007). Small stories, interaction and identities. Amsterdam and Philadelphia: John Benjamins Publishing Company. Giddens, A. (2000). Sosyoloji. Ankara: Ayraç Yayınevi. Haddington P. (2005). The Intersubjectivity of Stance Taking In Talk-In-Interaction. Doktora tezi. English Department, University of Oulu: Oulu University Press. Harré, R. (1991). Discursive production of selves. Theory and Psychology, 1(1), 51-63. Harré, R. ve Moghaddam, F. M. (2003). Introduction: The self and others in traditional psychology and in Positioning Theory. R. Harré ve F. M. Moghaddam (Yay. haz. ), The self and others: Positioning individuals and groups in personal, political, and cultural contexts içinde (s. 1-11). Westport: Praeger Publishers. Harré, R. ve van Langenhove, L. (1991). Varieties of positioning. Journal for the Theory of Social Behaviour, 21(4), 393-407. Hatoss, A. (2012). Where are you from? Discourse and Society, 23(1), 47-68. Hunston, S. ve Sinclair, J. M. (2000). A local grammar of evaluation. S. Hunston ve G. Thompson (Yay. haz. ), Evaluation in text: Authorial stance and the construction of discourse içinde (s. 74-101). Oxford: Oxford University Press. Hunston, S. ve Thompson, G. (2000). Evaluation in text: Authorial stance and the construction of discourse. Oxford: Oxford University Press. Jefferson, G. (2004a). Glossary of transcript symbols with an introduction. G. H. Lerner (Yay. haz. ), Conversation Analysis: Studies from the First Generation içinde (s. 13-23). Philadelphia: John Benjamins. Jefferson, G. (2004b). A sketch of some orderly aspects of overlap in natural conversation (1975). G. H. Lerner (Yay. haz.) içinde, Conversation Analysis: Studies from the First Generation içinde (s. 43-59). Philadelphia: John Benjamins. Johnstone, B. (2009). Stance, style, and the linguistic individual. Alexandra Jaffe (Yay. haz. ), Stance: Sociolinguistic perspectives içinde (s. 29-52). Oxford: Oxford University Press. Kiesling, S. F. (2009). Style as stance: Stance as the explanation for patterns of sociolinguistic variation. A. Jaffe (Yay. haz. 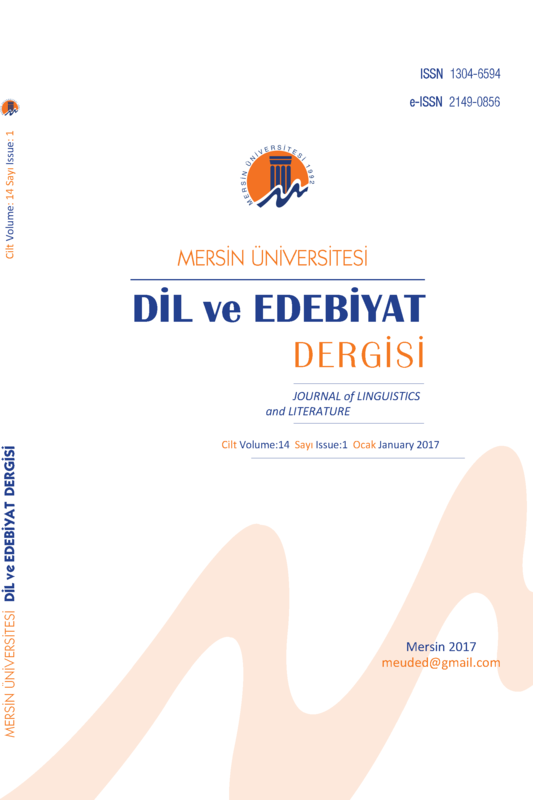 ), Stance: Sociolinguistic perspectives içinde (s. 171-194). Oxford: Oxford UniversityPress. Labov, W. ve Waletzky, J. (1967). Oral versions of personal experience. J. Helm (Yay. haz. ), Essays on the verbal and visual arts içinde (s. 12-44). Seattle: University of Washington Press. Martin, J. R. ve White, P. R. R. (2005). The language of evaluation: Appraisal in English. Londra: Palgrave Macmillan. Ochs, E. (1990). Cultural universals in the acquisition of language: Keynote address. Papers and Reports on Child Language Development, 29, 1-19. Ochs, E. (1993). Indexing gender. A. Duranti ve C. Goodwin (Yay. haz. ), Rethinking context içinde (s. 335-358). Cambridge: Cambridge University Press. Potter, J. ve Wetherell, M. (1987). Discourse and social psychology. Londra: Sage. Thompson, G. ve Hunston, S. (2000). Evaluation: An introduction. S. Hunston ve G. Thompson (Yay. haz. ), Evaluation in text: Authorial stance and the construction of discourse içinde (s. 1-27). Oxford: Oxford University Press. van Langenhove, L. ve Harré, R. (1999). Introducing positioning theory. R. Harré ve L. van Langenhove (Yay. haz. ), Positioning Theory içinde (s. 14-32). Massachusetts: Blackwell Publishers. Voloshinov, V. N.  (1973). Marxism and the Philosophy of Language. Cambridge, MA: Harvard University Press. Wetherell, M. (1998). Positioning and interpretative repertoires: Conversation analysis and post-structuralism in dialogue. Discourse and Society, 9(3), 387- 412. Wetherell, M. ve Edley, N. (2014). A discursive psychological framework for analysing men and masculanities. Psychology of Men & Masculanity, 15(4), 355-364. ISNAD Kökpınar Kaya, Emel , Uzun, Zafer , Ulusoy, Demet . "Duruş-Alma ve Konumlandırma: Evlilik Programlarında Benliğin Sunumu". Dil ve Edebiyat Dergisi 16 / 1 (January 2019): 1-20.